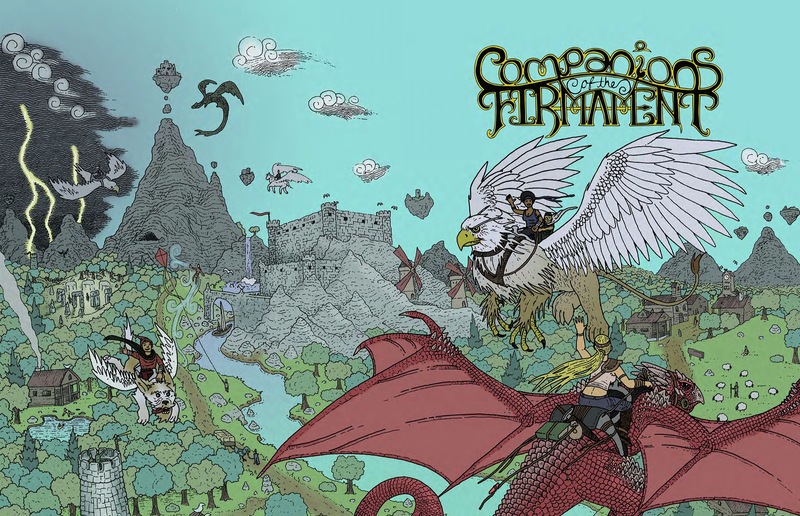 Companions of the Firmament is a Pathfinder Roleplaying Game compatible supplement that focuses on personal flight in your fantasy adventures and campaigns. It provides support for gamemasters and players, offering advice, mechanics and options from all sides of the table so that your adventures can take to the skies. This is a big book. So what's in it? Well the theme of the book is flying with the goal of putting your characters in the air more often. There are a few archetypes, some animal companions, some mundane and magical items, vehicles and a plethora of new flying rules including obstacles and rules for falling, and 3D movement. The character options are sound enough. Nothing caught me as particularly brilliant but it all seemed necessary and all were things I would see myself take. You definitely don't want to just throw some of these options at your players unless you are in the air often. Unless you're doing it all the time. Then you NEED this book. If you're flying every once and a while this is just a bunch of overpowered mounts and archetypes and vehicles, plus a bunch of words you don't really need that complicate something that can be handled with one skill. But if your players are flying early and often this book is mandatory. Flying rules just don't cover enough. Plus there's hazards expanded combat options and how to handle three dimensions in quick and easy ways. For that the book kind of gets 5 stars for being too useful even if situationally so. Because even if it's situationally needed, when you need it you NEED it and the price isn't too bad for it. Plus this opens up new kinds of campaigns that you couldn't do without. Campaigns of airships and dragonriders and floating continents. You can recreate the cartoon Dragonflyz if you wanted to. And that's really all that a product like this can do, open up a new world. This book is 188 pages long, 1 page front cover, 1 page editorial, 1 page KS-thanks, 1 page ToC, 1 page SRD and 1 page back cover, leaving us with182 pages of content, so let's take a look, shall we? Have you ever wanted to run an aerial chase, dogfights on dragons, with manticores, chimera and giant eagles crashing into one another, while their riders duke it out in free fall as their mounts try to rip each other asunder? Have you ever wanted to blast after a dragon-riding villain and perhaps even ride your own dragon to face the tyrant as your army and the forces of darkness clash below you? Have you ever wanted to jump from the highest window of the sapphire tower, jewel of Hashk-Kanep in hand, only to land on the back of your trusty Pegasus, while the sultan's enraged men cover the sky with hundreds, nay, thousands of arrows and bolts? If you have ever wanted to do something like that, then by all means, read on. Do you know what all of these scenarios have in common? They don't work properly in PFRPG. But more on that in a very short bit - after all, this book is about helped, personal flight - from the means to achieve it, broken down by class and taking various archetypes into account, this pdf leaves, from the very first page, no doubt on how serious it handles the topic: If you have ever had a flying PC or taken any amount of time to concoct a story-line featuring the lofty skies, you'll realize one thing as soon as you take a look at PFRPG's flight-rules. They're there. Somewhere. This pdf organizes them in a way that actually make them USABLE. Don't believe me that the basic rules are just not that well-organized? What about encumbrance for flying creatures that are quadrupeds? Why is this relevant? Flying mounts can't fly in medium or heavy barding - which doubles as counting as medium/heavy-load equivalent. Which means only light load, otherwise no dice for your flying mount to carry you aloft. I just wished I had this book prior to having to pierce this together from sentences throughout the core rule book. Now different playstyles have different preferences and hence, just about EVERY set of rules has three options - a simulation-style approach, a hybrid approach and a cinematic approach that is more focused on what's cool. Tables of mount sizes and rider sizes in comparison to show how many passengers they can carry, negotiation with intelligent mounts -all of that is concisely broken down and explained in a clarity that would have spared me about 2 weeks of frustration, book-switching and browsing through boards. Yeah, go figure. We get three classes in here - the magical beast rider (a cavalier archetype),who can teach his/her mount arcane talents and choose from selections as exotic as the winged cat & dog Bixie and Hainu to Griffons and Spider-Eaters. The airshaping sky pilgrim alternate monk, in the meanwhile, feels like an expertly-executed nod towards "The Last Airbender", gaining the option to shape winds, fly etc. and, in fact, working much better than the rather lame monk base-class. (Hint for Owen K.C. Stephens should he read this - I'd love to see this made "talented"...). Now speaking of former Super Genius, now Rogue Genius Games - their Dragon Rider base-class is powerful, but many people don't particularly like the amount of actions they eat. For those of you looking for an alternate take, herein is the Wyrm Rider, an alternate cavalier that rides on a domesticated, less dangerous species of dragon, which, while not as powerful as a regular dragon, also doesn't eat your actions for a different playing experience. This book being about flying companions, we get concise lists of animal companions that can fly, with entries on being ground-suitable, aerial trip CMDs, options to carry things (and people), full companion stats etc. - there is a LOT of work in these tables and they cover regular dragon cohorts gained via leadership and also faithful companions: The latter are rather ingenious options for characters in aerial-heavy campaigns that want a flying mount, but don't have the suitable class - faithful companions can be rescued, raised etc. and, while not as efficient as animal companions, make for awesome pets. The rules here are once again an example for concise, easy to grasp material. New race-wise, we get the Half-Fey - which comes with 6 variants that feature an ARG race-point break-down for each and range from their point values from 1 at 10 points to 4 11-point builds to 1 20 point-build for higher fantasy campaigns. Aforementioned Bixie and Hainu also get full statblocks/bestiary-style entries, as do so-called lesser chimera, which essentially are flying animals that have a rather simple template added. oh, and we get a one-page easy-to-grasp overview over flying constructs with a streamlined single look, you have all information handy on one page. At this place in time while writing this review, I was honestly feeling like I was failing - why? Because I just can't mention everything this book does, the level of detail it provides - take weapons - not only do we get new ones, this book also deals with the question what happens when flight is common in a setting: The importance of ranged combat and the proficiency thus required, a whole page of bardings, signaling kites, slow-burning smokesticks, aeronautic balloons - and all of these even before brooms of flying or even Thunnorad, Thor's chariot (WITH properly spelled names for the two rams - the scholar of Scandinavian literature rejoices!) or flying Vardos enter the fray with concisely-worded and at the same time iconic rules. Oh each, OF COURSE, also are all collated in tables with appropriate NPC levels / PC levels to have them, gp value etc. - If only the regular rules were that well organized! Now if you've been following my reviews, you'll know that I consider vehicles to be underdeveloped and this book also has some ideas here - first of all, it proposes a less insane driving-DC (which I've house-ruled ages ago); secondly, from balloons to alchemical skiffs and air barges to batman-style kite-gliders, we get some cool additional vehicles. Yay! Suffice to say, once again, the rules are almost painfully concise and easy to grasp in their presentations. Now remember the example at the beginning, with the sultan's archers? Want to fly over an enemy army and rain death on them? enter missile mooks! By providing concise rules for volley-shots of large quantities of archers/crossbowmen and no less than 4 (!!!) pages of tables that include perception, CRs, XP-values, ACs, atks and damage, we get mooks for literally EVERY situation, spanning the Crs from 1/3 to 18! This chapter will get a tremendous amount of use, not only by me. Have I mentioned concise lists of flying mounts by their terrain that cover the first 3 bestiaries 8the 4th hadn't been released yet...), the extensive rules on creating storms with wind-speeds, rain, climate, clouds, max visibility and special occurrences like lightning, hail and turbulences? Oh, for EACH SEASON and THREE CLIMATES? a concise system to create weather hazards on the fly? What comes up, must come down, as the saying goes, and falling-rules, from simulation-style half-rounds to cinematic style options to ground-catch or mid-air catch targets are not only explained, their pros and cons are weighed and individual systems are provided for your preference. so yeah, if you always thought that Superman's arms should have sliced Lois Lane clean in three parts - here are rules for that as well as one-glance tables that show you the amount of damage caused. And yes, unconsciousness, the diehard feat, ferocity, being big and rings of feather falling - all in here, all taken into account. Now how to handle this grid-wise? The book actually also has various ways for you to handle this, with sidescroll, top-down, full-blown 3d via two maps and tables of vertical reach summed up cleanly for you. If you don't want to go full-blown simulation, there are varying and all feasible abstract grid-options with corresponding rules to be found in here as well, including abstract ranges, movement etc. The Fly-skill's maneuvers, including u-turns of varying degrees on a more simulationalist grid are also perfectly explained and detailed alongside ascending/descending. And yes, they are expanded from the basis provided to include e.g. 135°-turns, the concept of expanded flight and different ways of dealing with the problem of the face of creatures -whether you want to keep it or get rid of it - this book has you covered. Have I mentioned strong winds, flying through canopies etc.? Gamemasters aren't left hanging in the cold stratosphere either - this pdf literally has thought EVERYTHING through: The repercussions of common flight, from preferred weapons to the role of small folk like halflings and gnomes, the costs of maintaining herbivore/carnivore armadas of flying creatures, trade winds, guild-systems, flags & pennants, politics, ley lines, artforms (GEOGLYPHS! ), strategic cliff-dwellings, food pyramids, overland travel via fly-speed distances (again, in 3 different forms) - this chapter is a world-builder's dream and perfectly summarizes key question of what would change in a world if flying was really common. That is not where this book stops, though - Fly maneuverability templates and companion/cohort-sheets for just about EVERY CREATURE as well as token galore for the creatures, a missile mook sheet, a rules-checklist (so you can recall which of the various options you and your players settled on - e.g. a world with trade winds, but no organized sky guilds?) and finally, a concise summary of fly, ride and handle animal-skills -all of these can be found in here as well. Editing and formatting are SUPERB - I only noticed two minor typos, one of which was my nick in the backer-list, but who cares - at this length an impressive achievement. Layout adheres to a printer-friendly, easy-to-read 2-column b/w-standard that makes the tables herein (and there are A LOT) easy on the eyes. The b/w-artwork, of which we get a LOT is rather cartoonish/very old-school in many places, whereas some pieces are downright awesome. It took me some time to get used to it, but it does have its charm. The pdf comes fully bookmarked for your convenience and if you can track one down, get the hardcover - it is solidly and very professionally produced. I'm not 100% sure whether all the creature-sheets of the KS are included with this book on non-KS-venues, so I can't include those in my final verdict. This book left me utterly, completely flabbergasted. I backed this when I wasn't as dirt-poor as I'm right now on a whim and honestly didn't expect to ever see it. One company that never released a supplement prior to this one, what can one expect? I had honestly forgotten about this book when it found its way into my mail-box - not due to excessive delay, but simply due to much on my plate. In an age where kickstarters by established RPG-companies sometimes are overdue by more than 2 years and often lack anything resembling regular communications, this was one surprise. It went promptly on my shelf in favor of daily reviewing and only after some time found its way into my hands. I read it and my jaw just dropped, smashed through the floor and hit the floor of the cellar. I'm living on the 8th floor. This is a once-in-a-blue-moon-book that is not only a testimony to Neil Carr's dedication and passion to the topic of flight, but also to his work ethics: To think that ONE designer made this is mind-boggling. Let me spell it out: This book belongs into the library of every PFRPG-DM. No exceptions. Ne leeway. This is the Cerulean Seas of the sky and does what Cerulean Seas did for underwater adventuring (albeit aesthetically slightly less appealing) for flying, aerial combat, aerial campaigns etc. I'm going a step further: Players wanting to play flying characters should get this and get their DM a copy. This book is a milestone, a glorious beast that came from nowhere and that shows that having no track-record is never an excuse for faulty rules-language: This is as tightly worded, as concisely phrased as any book by Paizo, perhaps even beyond it. It covers all topics, intelligently and in varied ways and manages to deliver something for ALL playstyles, with huge amounts of customization-options. This is a RULE-book to judge all rule-books, a supplement that ups the ante, a book that is a superb example on what kickstarter can deliver - "Companions of the Firmament" is as important for PFRPG as Cerulean Seas, as the APG or Psionics Expanded; This is a Rulebook of the highest caliber that will be used all the time - you have no excuses; Unless you don't want to cover flight at all (then why are you reading this? ), this book should be considered one of the best possible investments into rules one can currently make. This is revolutionary in much the same way as Ultimate Campaign is when combined with Legendary Games' stellar supplements to actually make the system work. Unless you're very focused on artwork/layout, this pdf, and that I can guarantee, will NOT disappoint you - the sheer amount of useful rules, options etc. herein mean that there is no way I could rate this any other way that offer the highest praises. If there were ten stars, this would be 10/10. If there were 6, this would be 6/6 - by any scale I apply, this ranks among the apex-books in its usefulness, coolness, level of detail it covers and foresight. This must be a 5 star +seal of approval, a hot contender for the no. 1 spot of my Top Ten of 2013 and the most furious, impressive first product I've seen any 3pp produce in ages. Miss this at your own peril. I got this pdf and hardcover through the Kickstarter. This book has several options for characters, including three archetypes. Two of these archetypes are for the cavalier, magical beast rider and wyrm rider. The other is the sky pilgrim for the monk. One new race is included: half-fey. Also included is various equipment, magic items and aerial vehicles. There are sections covering challenges like falling and missile mooks. A chapter is dedicated to concepts of an aerial battle grid, abstract aerial combat, the fly skill movement and further flying rules. Will the physical book not be available here? Good to see an endzeitgeist review. My review of this one is actually rather old - from last year in fact, but it wasn't available on Paizo back then, thus my review was probably exposed mostly to people via endzeitgeist.com, Pathways or similar means. Given the size of this book and the high quality, the price is extremely low. Not in the immediate future, but I am looking into it. The Kickstarter was not big enough to do a regular print run so the book is print-on-demand at the moment and that ends up being a bit more clunky of a route to get hardcopies onto the Paizo store. Thanks for the exhaustive review. It's good to hear the approach and effort I put into it is playing out well for others. When I was breaking out the book one of the central ideas was that if I was going to write a book it would be as close to the kind of ideal RPG reference material as I could hope for, so it has that "by gamers, for gamers" usability. One thing that time and money did not allow for were designer notes in the book. I did try and inject some design considerations into the text itself, but I couldn't go into the footnote level of detail I would have wanted so that my design reasoning was made clear. You're review covers so much that I'll try and do some followup posts to elaborate on some of the book's elements. Yeah, the price has been a challenge on my end. I experimented with a higher price initially, however there really wasn't much movement with the book so I shifted down and the sales began to climb. Pricing is definitely a balancing act! Any plans for other books? I would like to see more from GIC.